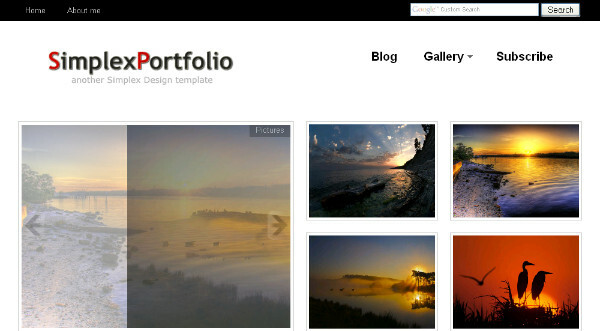 The simplex portfolio free blogger template is a fantastic template for any photographers looking to display their photos in a blog.The template has a large photo slider that slides through selected photos and 12 smaller photo areas.The template also has a posting area for text and other information,This template is perfect for photographers of all levels from beginners to professionals. This Blogger template is great for a photography blog although their are their are other types of blog it would also suit.Their are a number of changes and edits needed to get the most from the template, for more help visit the Designers page via the link above. Great piece you’ve produced right! The internet is stuffed with horrid penning and I used to be grabbed by your limpidity. Your decisions are exact and I will straightaway subscribe to your rss or atom nourish to stay day utilizing your up emerging postings. Indeed! I admit it, your composition fashion is unbelievable and that i is fine much more concentrated on mine. Another great template by Simplex. Huy does fantastic work! nice themese my edit http://www.xfunnyclip.com ^^! I've tried to use this template but I just can't seem to make it work. I've read your designer page instructions. Is there any other instructions that I am missing. I would appreciate the feedback.